It’s always been a bit difficult to clearly describe the size difference between the King Isosceles and the Isosceles Modern firebowls… Especially because the two firebowl designs are cut differently, so the measurements can’t be described the same way. The King Isosceles is cut by drawing a single triangle on a 37 inch diameter bowl and cutting away three curves to make a deep triangular bowl. 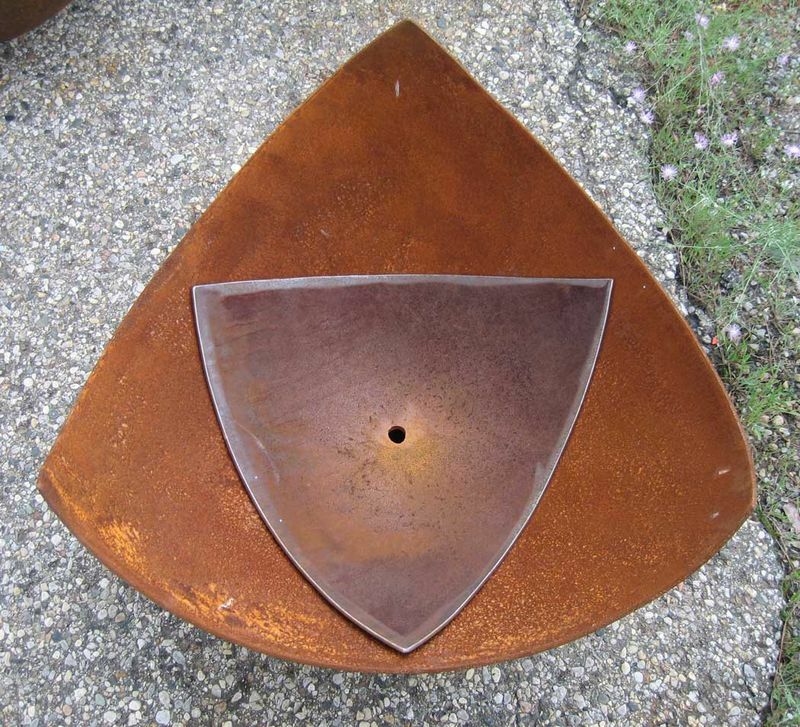 The Isosceles Modern is made by cutting a 37 inch bowl into quarters to make four smaller fire sculptures. This is why it has a much shallower draft. Because spherical geometry is weird, mind-bending stuff, the resulting four pieces are larger than you think they’d be. The photo below shows a finished Isosceles Modern on the left and the King Isosceles on the right, both against the bowls they are cut from. 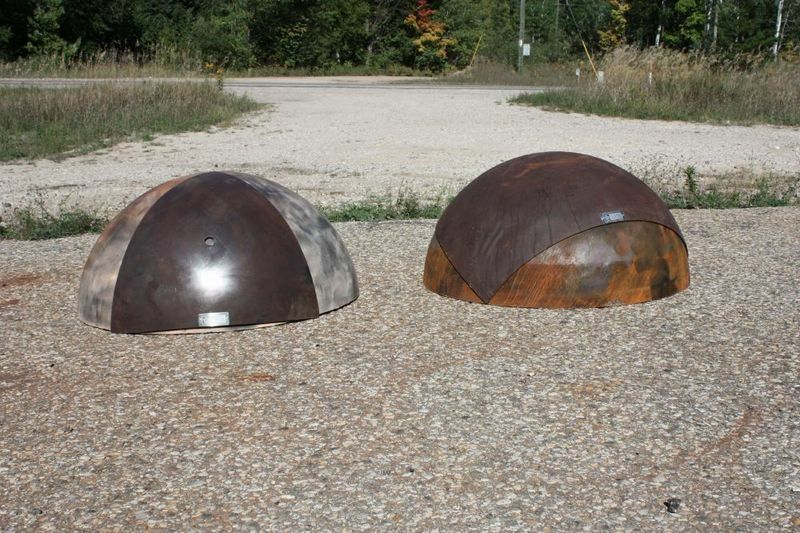 Weight: 110 pounds Dimensions: 37″ Diameter, 22″ high overall, base is 12″ in diameter. Weight: 45 pounds Dimensions: 25″ point-to-point, 12″ high overall, base is 9.5″ in diameter. 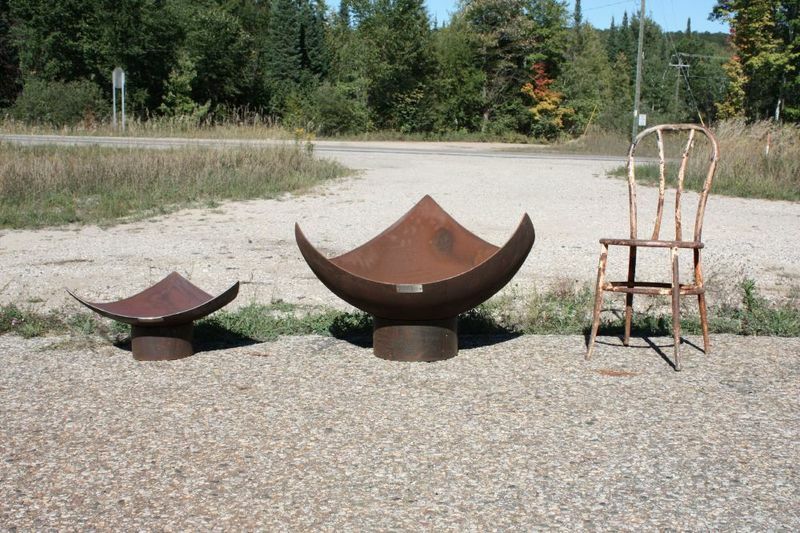 Here’s a photo that shows the Isosceles Modern and the King Isosceles 37 inch diameter firebowls side by side, with a chair for scale. You can see in the photo above how much steel is cut away to make the curves between the points. 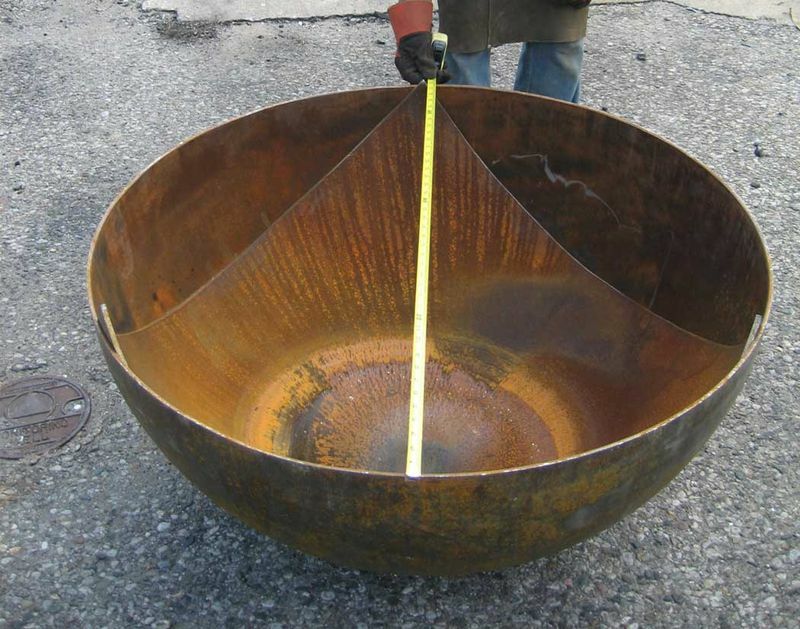 Using diameter for the measurement still makes sense though because a 37 inch diameter King Isosceles will occupy roughly the same space as a 37 inch Big Bowl O’ Zen. Here’s yet one more photo to help show the difference. Here, I’ve placed an Isosceles Modern inside a 37 inch diameter King Isosceles (without the base). Because they are cut from the same size of bowl, the curve is the same… the Modern rests easily in the curve of the King. You can see that although the modern is much smaller, it almost reaches the edges of the cut-aways on the larger bowl. So it takes up almost as much space, but has a shallower draft for fire and is not nearly as tall when viewed from the side. So which one should you order? If you want to sit around a fire and socialize, the King Isosceles will be a better choice. The Isoceles Modern works best as a decorative fire feature, or as lighting, or in small spaces.